NAR PULSE— NEW! 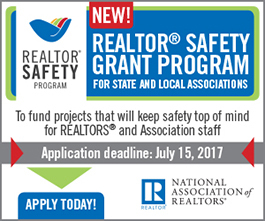 Associations can apply for a Safety Grant to assist with funding projects that will keep safety awareness top of mind for REALTORS® and association staff. Grants are available up to $2,500. Funding is limited. Applications will be accepted June 1-July 15. Full details, criteria and applications can be found at NAR.realtor/Safety/Grant. Start your application. There’s still time to sign-up for the Member Value Plus (MVP) Program and start earning FREE business-boosting rewards by taking simple actions. Today is the last day to sign up to be an MVP and earn the FREE reward, How to Reach Millennials Through Instagram and Snapchat Webinar – Download, plus be automatically entered to win a grand prize, including a Google Home and Bose Bluetooth Headphones. Act now! Luxury sellers know they need more than gorgeous photography and an agent with a vast network of contacts. When every luxury agent is offering international advertising and going beyond typical showings to create a truly rich experience, how can you stand out from the crowd? Join realtor.com® June 2 at 10:00 a.m. PDT to find out more! Register now.